Any consideration of the relative abundance, cost, and variability of specific resources in prehistoric environments truly deals with uncertainty. 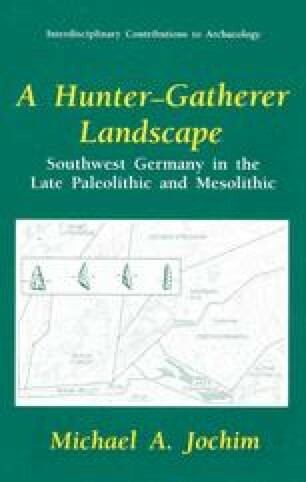 In the particular case of southwestern Germany at the end of the last ice age we confront habitats that no longer exist, with plant and animal associations that cannot be found today. Moreover, these habitats changed at irregular rates, probably with different effects on each potential resource. At best, we can use archaeological finds and modern studies to develop a general impression, in terms of rough rankings rather than spuriously precise quantification.